Olemic Thommessen, the embattled president of Norway’s Parliament (Storting), finally bowed to pressure on Thursday and announced that he would resign his post that’s second only to the monarch’s. After years of controversy over several issues, Thommessen fell victim to massive budget overruns on a construction project for which his office had responsibility. Thommessen’s announcement was brief and to the point. He said he had received word that the Christian Democrats party had “withdrawn (its) support” for him. The small centrist party had held the swing vote on whether a majority in Parliament still had confidence in Thommessen. When the Christian Democrats made it clear they also had lost confidence in Thommessen, Thommessen had two choices: resign voluntarily or face a humiliating vote of no confidence in Norway’s national assembly. He made his announcement just after Thursday’s parliamentary session opened at 10am. Thommessen then quickly moved on to other matters and showed little if any sign of emotion or regret. It’s an historic defeat, not just for Thommessen but for the Parliament itself. 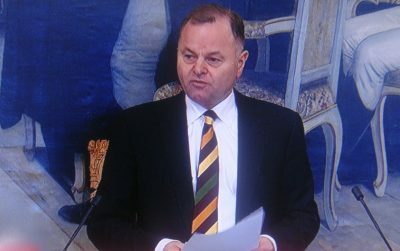 The building scandal, which started out as a remodelling project with a budget of NOK 70 million that’s now expected to cost at least NOK 2.3 billion, has embarrassed all Members of Parliament and brought the credibility of the country’s most important legislative insitution into question. A State Auditor General’s report last summer was ruthless in its criticism of Thommessen and his colleagues in the president’s office, who had administered the construction project instead of turning it over to the state’s building authority Statsbygg. Yet the budget overruns continued, and when it became clear a few weeks ago that another NOK 500 million would be needed, Thommessen was ordered to account for the scandal on the floor of Parliament. That was historic in itself, yet the veteran politician from the Conservative Party refused to resign, continuing to feel he had the support of the conservative government coalition parties behind him (Prime Minister Erna Solberg had re-nominated him just last fall). All the opposition parties called for his resignation, however, including the Labour Party that remains the largest single party in Parliament. They all claimed that Thommessen continued to blame others for the budget overruns, refused not only to resign but to show little remorse and that he seemingly had shown little regard for taxpayers’ money. Solberg, who has faced harsh criticism herself for continuing to back Thommessen, was due to address the scandal and Thommessen’s resignation Thursday afternoon.